Exceptional accuracy at high update rates. DIN Rail mounted, digitally programmable. The Laureate Resistance Transmitter is ideal for high-speed, high-accuracy resistance measurements in a production environment, such as contact resistance measurements. It is factory calibrated for five jumper selectable resistance ranges from 20.000 ohm to 200.00 kohm. Factory-special, fixed ranges of 2.0000 ohm or 2.0000 Mohm are also available. Accuracy is an exceptional ±0.01% of reading ± 2 counts. Resolution is one part in 20,000. In the 2 ohm range, resolution is 0.1 milliohm for contact resistance measurements. Transmitter connections can be via 2, 3 or 4 wires. With 4-wire hookup, 2 wires are used for excitation and two separate wires are used to sense the voltage across the resistance to be measured, thereby eliminating any lead resistance effects. With 3-wire hookup, the transmitter senses the combined voltage drop across the RTD plus two excitation leads. It also senses the voltage drop across one excitation lead, and then subtracts twice this voltage from the combined total. This technique effectively subtracts the lead resistance if the excitation leads are the same. All resistance ranges are digitally calibrated at the factory, with calibration factors stored in EEPROM on the signal conditioner board. This allows ranges and signal conditioner boards to be changed in the field without recalibrating the transmitter. If desired, the transmitter can easily be calibrated using external standards plus scale and offset in software. High read rates at up to 60 or 50 conversions per second while integrating the signal over a full power cycle are provided by Concurrent Slope (US Pat 5,262,780) analog-to-digital conversion. High read rates are ideal for high-throughput manufacturing processes. Peak and valley values are automatically captured and may be displayed via a front panel pushbutton command or a control signal at the rear connector, or be transmitted as serial data. Custom curve linearization, available with the Extended version, makes this transmitter suitable for use with transducers whose output is a non-linear changing resistance. Linearization is provided by curvilinear spline fits, and the reading can be scaled in software for user-selected engineering units of measure. *** The applied excitation current is sensed by the meter, which operates in a ratiometric mode and automatically compensates for any changes in excitation. Ohm transmitter hookup can be via 2, 3 or 4 wires to the J5 connector. The transmitter applies a fixed excitation current for each resistance range. In 4-wire hookup, different pairs of leads are used to apply the excitation current and sense the voltage drop across the unknown resistance, so that the IR drop across the excitation leads is not a factor. In 3-wire hookup, the transmitter senses the combined voltage drop across the unknown resistance plus two excitation leads. It also senses the voltage drop across one excitation lead, and then subtracts twice this voltage from the combined total. This technique effectively subtracts all lead resistance and compensates for ambient temperature changes if the two excitation leads are identical. In 2-wire hookup, the transmitter senses the combined voltage drop across the unknown resistance and both lead wires. The voltage drop across the lead wires can be measured by shorting out the resistance during transmitter setup, and this voltage is then automatically subtracted from the combined total. However, changing resistance of the lead wires due to ambient temperature changes will not be compensated. A deviation limit (50 mΩ in this example) is set up around both sides of a setpoint. The relay closes (or opens) when the reading falls within the deviation band, and opens (or closes) when the reading falls outside of this band. This mode sets up a passband around the setpoint and can be used for contact resistance testing in a production environment. 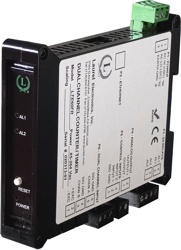 Note: The same signal conditioner board can be used for resistance and RTD temperature measurement.